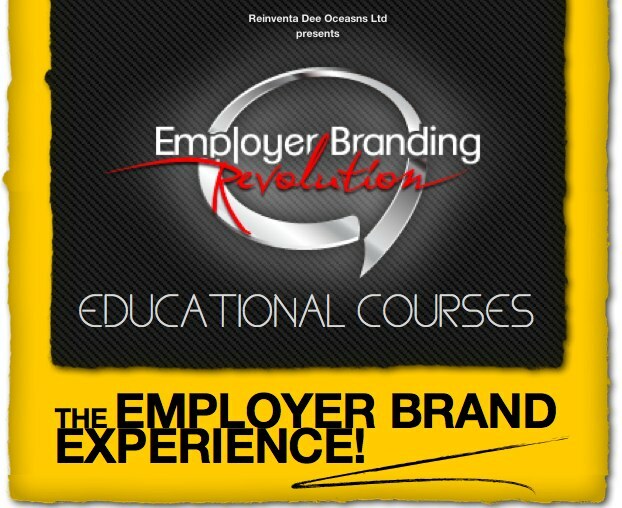 The Employer Brand Experience, the educational course by Reinventa Dee Oceans, is Learning by doing! Davide Scialpi will be holding a Master Class on the Employer Brand Management at Tiblisi, Georgia, The Marketing House! How's it going? Hope all is well with you! This post is to simply tell you that in a couple of weeks I will be in Georgia, at Tiblisi. I will be holding a 7 hours Master Class on how to manage the enterprise employer brand strategies in the digital era from a glocal perspective. In particular, I will be speaking at the Marketing House. A 7 hours presentation on how to set, plan and implement an employer branding strategy today in such turbolent times. Thanks for paying attention and for following us everywhere! 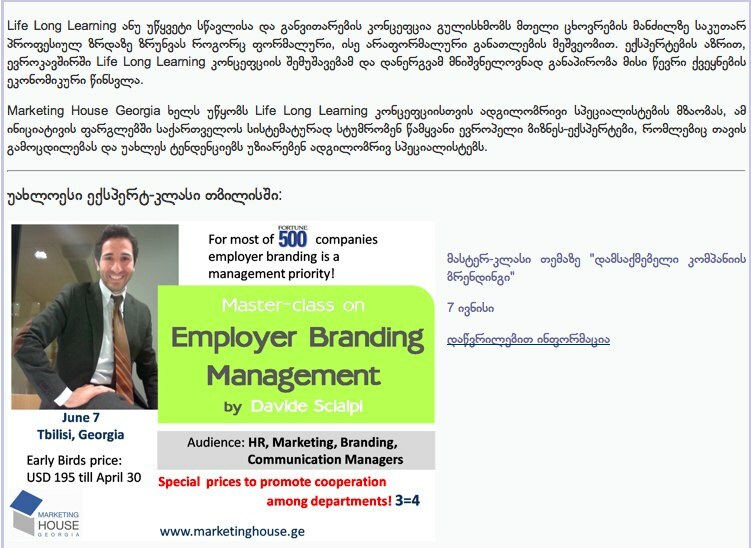 New initiative by Employer Branding Revolution is coming, guys!. We are now committed to delivering a 2 DAYS Training Course about How to build a winning employer brand strategy!. Called The Employer Brand Experience, it will take place in Milan at Blend Tower on May 7th and 8th , involving successful specialists from companies and organizations one step ahead in respect to this theme: LINKEDIN, BNL BNP PARIBAS, THE BOSTON CONSULTING GROUP, UNIVERSITY OF TRENTO, SERENELLA PANARO, REINVENTA DEE OCEANS, DAVIDE SCIALPI, SIMONE MAGGIO. After interviewing Diego Marini from BNL BNP Paribas, We decided to involve another trainer taking part of our event course. It's the Stefano Lavizzari turn, everybody!. 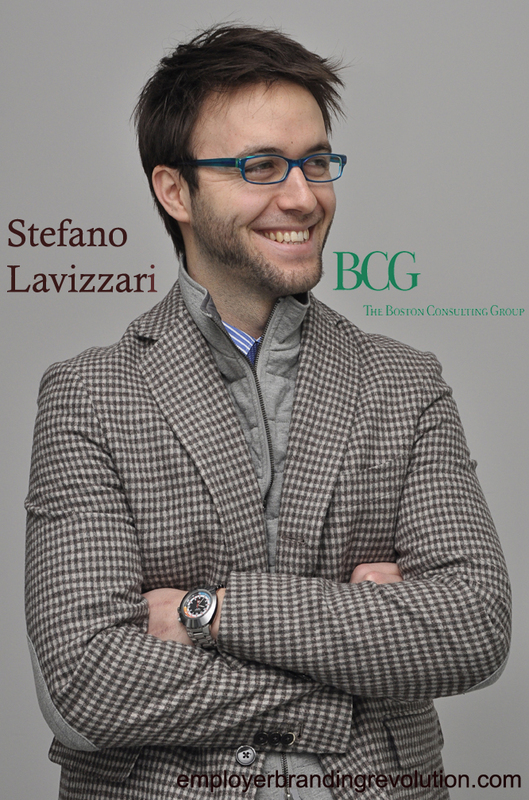 Stefano is Recruitment Specialist at The Boston Consulting Group. He will be our Special Trainer in occasion of DAY1 on May 7th and he will be deeply telling us about BCG Employer Branding Strategies in occasion of the Back to Business session! D: So, thanks so much Stefano for joining us and for your time. First question I wanted to ask you is: In terms of soft and hard skills, What makes the difference for being hired by a prestigious strategy consultancy firm like The Boston Consulting Group today? S: "..well..when we recruit in BCG, we do not have a "standard", we do not have "specific requirements" (only full marks, previous consulting experience, etc.). We are looking for people. During our recruiting process we try to find "well rounded profiles": you should be strong in problem solving, analytics and logic, but also a team player with excellent listening skills, very curious and creative. Last but not least, commitment and drive are essential to be a BCG Consultant..."
D: Does BCG recruit high-achievers economists and management engineers only ? S : "....Diversity is fundamental, so we have colleagues with different academic and professional backgrounds: degrees from Engineering to Social Sciences, PhDs, MBAs – fresh graduates, expert from Industrial companies, Professor from Universities. Everyone could find his path in BCG...."
D: What are the must-know do's and don'ts to succeed when interviewing for open jobs at The Boston Consulting Group? S : "....First of all, be yourself. The interview is the time where we could understand the fit between the candidate and the firm, and vice versa. Don't be shy and ask questions, enjoy this moment with BCGers and try to imagine your future with us! Share your energy and passion for this job!..." D: So, What is not BCG as place to work? S: "...For sure, BCG is not a competitive environment. During my time in this firm I have found very collaborative and reliable colleagues. The only competition you have to face is with yourself: everyone wants to give the best to grow further professionally and personally!.." D: With BCG, You had a work experience as Recruiter in Poland too, Did you find any differences between italian job seekers and the poland ones in approaching job ( acts, behaviours, dreams, wants,expectations), having a recruitment interview and in terms of possessed skills and competences ? S: "...I think the main difference among polish and Italian job seekers is about their pragmatism. Polish guys are very direct in asking questions about salaries, working hours, lifestyle – Italians seem more interested in the Firm's values, work environment and growth opportunities. On the other hand, no difference in terms of possessed skills and competences". D: How important is the touch points management with job seekers for BCG and how do you manage that during the candidate experience? "...I believe it's essential being transparent and clear when you speak with your candidates. Unfortunately, 90% of the time is about giving negative feedback, but it's also a key part of the recruiter job. Collect information and provide comments about strengths and needs of the candidates – they are not a number to fill or reach, they are a human being like you!" D: What does it mean working at BCG from your angle ? S: "...Working in BCG means collaborating with smart, creative, curious people that are always looking for the best solution in every situation. Very stimulating environment with great growth opportunities – internal and external, local and global!" Dopo il successo del Workshop Internazionale Employer Branding Revolution LIVE TOUR, Il 7 e 8 Maggio 2013 a Milano va in scena la seconda iniziativa targata Employer Branding Revolution ( Il network community più autorevole nel campo dell'employer branding a livello mondiale) . 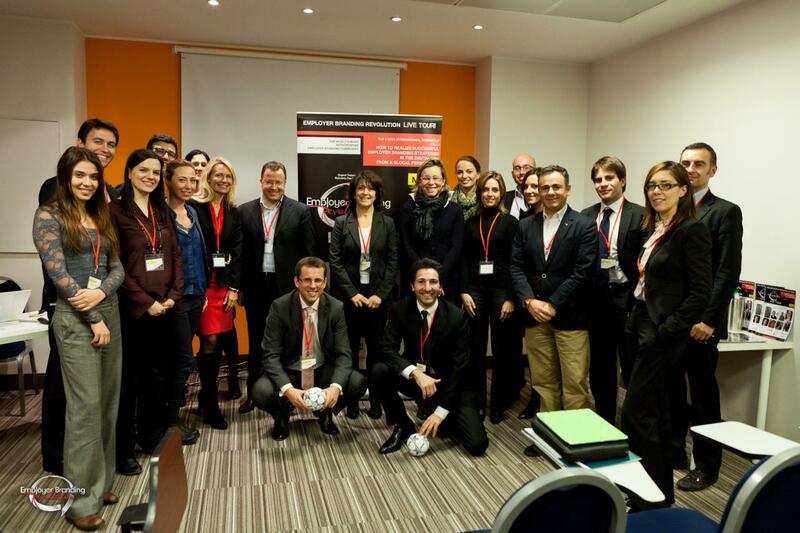 Questa volta trattasi di un Corso di Formazione Professionale di 2 giorni sui temi dell'employer branding e che vede coinvolte come eccellenze nel campo aziende di prim'ordine come THE BOSTON CONSULTING GROUP, Società di Consulenza Strategica tra le più quotate al mondo, BANCA NAZIONALE DEL LAVORO - BNP PARIBAS, tra le banche più prestigiose al mondo, LINKEDIN, Il social network professionale n1 al mondo nonché specialisti della comunicazione e della formazione come SERENELLA PANARO, business and career coach presso l'Università di Trento, DAVIDE SCIALPI, Esperto e leader di pensiero internazionale sui temi del marketing e la comunicazione digitale per il branding e dell'employer branding. La sessione formativa si intitola THE EMPLOYER BRAND EXPERIENCE - HOW TO BUILD A WINNING EMPLOYER BRAND STRATEGY e in occasione del DAY2 prevede per tutti i partecipanti che vi si iscrivono un paio di ore di formazione esperenziale pratica per migliorare anche le proprie capacità di public speaking. In altre parole, esercizi e pratiche per migliorare le proprie capacità di comunicazione verbali e non verbali, alquanto essenziali e indispensabili per un manager che oggi più che mai si trova ad interfacciarsi quotidianamente con attuali e potenziali dipendenti che rappresentano nel contempo anche potenziali clienti nonché stakeholder dell'azienda di cui si fa parte. Tra i suoi hobby rientrano il Karate Shokotan e la Psicologia Analitica. 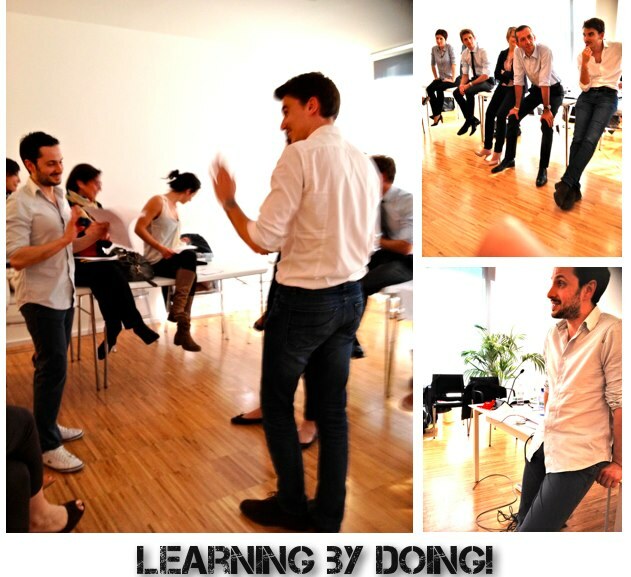 Il 7 e 8 Maggio 2013 a Milano presso Blend Tower, Piazza 4 Novembre, SIMONE MAGGIO sarà uno dei nostri special trainer. The Employer Branding Revolution TEAM! Employer Branding Revolution is going to be newly on. We are now committed to organizing a brand new initiative for all our followers. It will nearly be a 2 DAYS Educational Course about How to build a winning employer brand strategy!. It's named The Employer Brand Experience, it will take place in Milan at Blend Tower on May 7th and 8th and it will involve successful trainers and specialists as well as well-known companies and organizations: LINKEDIN, BNL BNP PARIBAS, THE BOSTON CONSULTING GROUP, UNIVERSITY OF TRENTO, SERENELLA PANARO, REINVENTA DEE OCEANS, SIMONE MAGGIO. As you know, we are used to involve our speakers / trainers in very flash interviews to know more about them. 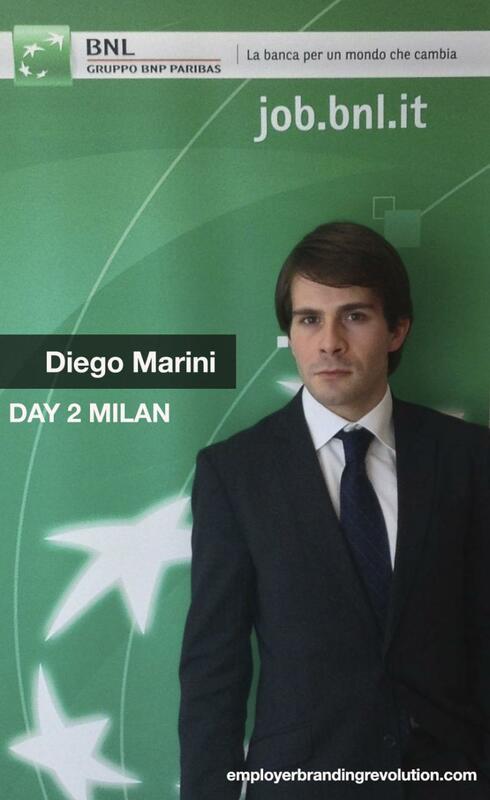 This time it's the Diego Marini, turn. Diego is Talent Acquistion Strategy Manager at BNL BNP Paribas. He will be Special Trainer in occasion of DAY2 of our Educational Course, telling us more about BNL BNP Employer Branding Strategies within a special session named Back to Business! DS: So, here we go Diego! Firstl of all, thanks so much for accepting to have an interview with us. That’s a pleasure to us. To start, In just a few words, could you please tell us more about which strenghts of your professionalism have permitted to you to reach the goal of being Talent Acquisition Strategy Manager at BNL BNP PARIBAS Group ? DM: "Well....first of all Davide thank you for giving me the opportunity to actively join the Employer Branding Revolution “Dream Team”. Answering your question, you know I have a background in Management Consulting (about 7 years of experience there), where I faced several and various subjects, with a focus on HR&Organization ones. This experience helped me to become really flexible and able to face with everyday different tasks with creativity and passion, trying to develop new competencies in the faster possible way. So, my journey in Management Consulting surely supported me and my professional profile to be “attracted” by a great international Group as BNP Paribas, specifically in BNL, an excellent environment where innovation is a strategic “must”. In addition, by myself, I think I am energetic, pro active, reliable and love changes and challenges, I think these attitudes helped me too. DS: Based on your experience, in nowadays what kind of peculiarities are required for getting possibility to be hired by a Bank as well as to run a successful career within the banking sector? DM: "...flexibility, passion for innovation, international mindset and a practical approach in the same time are some of the main features a potential candidate should have to have a successful career in a Bank. We are facing with a dynamic and changing market and it is important that people are ready to approach with new methods, new subjects, new ways of work in order to positively answer to the organization needs. DS: What’s the most frequent managerial quote you are used to repeat your self for the decision making of your daily job? DM: "...Sure, I got it: “Be Yourself, Follow Your Dreams and Deliver Excellence”. This is my philosophy. It is composed by two emotional concepts and a most operational one. Let me explain. To succeed you should try to be always yourself, considering your attitudes as a treasure and applying them to the environment you are working in, of course adapting as needed. Dreams have to be a goal for you and you should hardly work to obtain what you want, think that everything is possible. When you are yourself and you are following your dreams you will surely deliver excellent results. I think that is true both in professional and personal life. 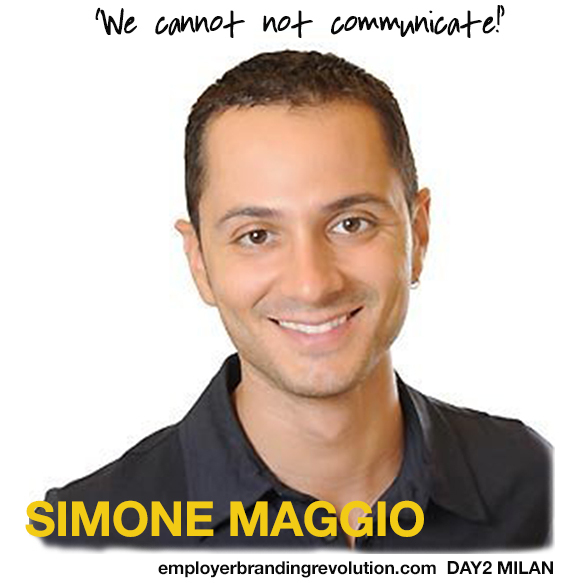 DS: Diego, as we know, you will be special trainer for Empoyer Branding Revolution next 8th of May in Milan, Could you please reveal us and share with us some points of your presentation in occasion of DAY2? DM: "....During my presentation at the session I will try to transfer to attendees my personal experience in, I would say, "Total Employer Branding Strategy" that is the virtuous mix of Employer Branding dedicated to the external, the Internal Branding dedicated to company employees and Personal Branding. For a successful Total Employer Branding Strategy all these components should be accurately managed. I will not bring only a theoretical approach but mainly a practical one, trying to underline all the main aspects of the innovative Employer Branding Strategy BNL has activated and is currently managing. Stay tuned for details!...." DS: What does it mean being Talent Acquisition Strategy Manager in BNL BNP PARIBAS and what does it mean working at BNL BNP PARIBAS from your personal point of view ? DM:"....In my opinion, It means to have a great opportunity! To have an opportunity to develop deep Talent Management & Acquisition skills and HR ones in general, to feel free to propose my own innovative projects and to be sponsored by the top management, considering BNL as a pure innovator in the Financial Services industry. It means also to be part of a solid international banking group where mobility is considered as one of the main steps for the professional growth of an employee. As Talent Acquisition Strategy Manager I really feel I have a mission: to find and attract the best talents in the market, talents for a changing world, using method and a "project" approach for each open position to be covered. That is very challenging and I like it!....." Employer Branding Revolution in the US and in the UK! 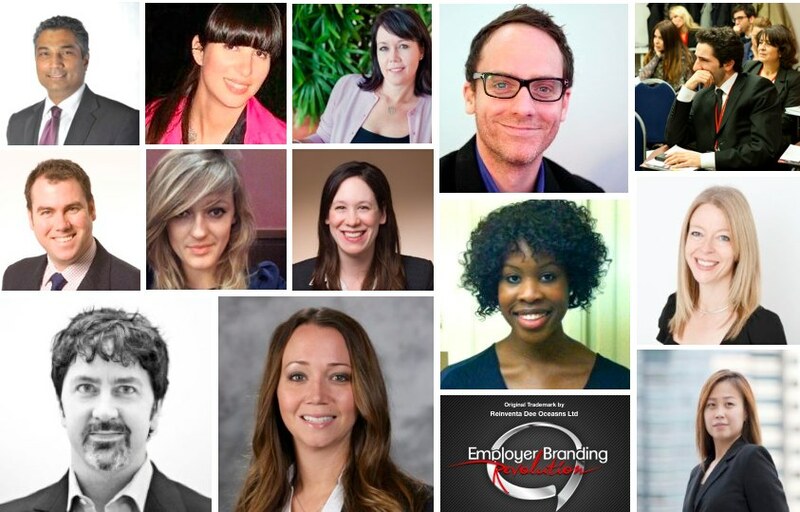 Employer Branding Educational Courses - REGISTER NOW!